Let’s not be moralists or conventional, even in the field of leisure, even because we should allow ourselves the controversial but unquestionably necessary, and notably salutary, “work with the psychological shadow”, advocated by the Swiss psychiatrist Carl Gustav Jung. 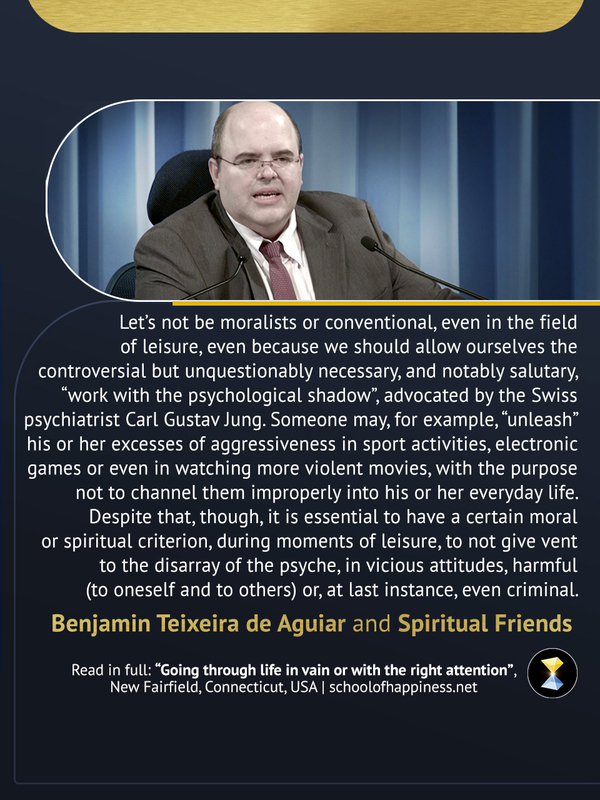 Someone may, for example, “unleash” his or her excesses of aggressiveness in sport activities, electronic games or even in watching more violent movies, with the purpose not to channel them improperly into his or her everyday life. Despite that, though, it is essential to have a certain moral or spiritual criterion, during moments of leisure, to not give vent to the disarray of the psyche, in vicious attitudes, harmful (to oneself and to others) or, at last instance, even criminal.